This year one of Russia's leading truck producers launched production of its new model, the Gazelle Next. Experts predict a European debut is not far. 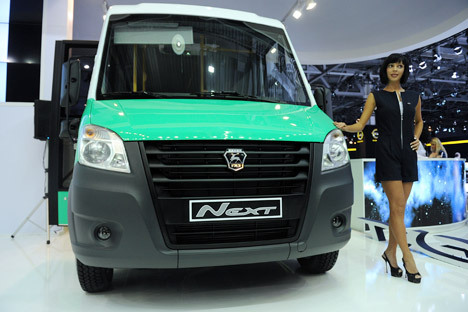 GAZ Group in April unveiled the second generation of its light commercial vehicle (LCV), the Gazelle Next. And even if the new model doesn’t turn out to be the nationwide best-seller in Russia that its predecessor was, it has come to the market at the right time. GAZ broke into the LCV market in the post-Soviet era of the early 1990s, when there was no LCV market to speak of. The few dozen thousand such vehicles that were produced were mostly used as special-purpose vehicles. However, the number of small companies in Russia mushroomed and the undemanding, cheap commercial vehicle offered by GAZ proved popular. With some parts poached from the Volga car also made by GAZ, simplifying servicing the vehicle, the Gazelle became a success. Over the next 20 years, more than 1.5 million Gazelles were produced and the brand entered the Russian language as a word for “light truck.” A few spin-offs appeared, too — the Sobol people carrier and the medium-heavy Valdai truck, for example. Still the unchallenged leader in the LCV segment, by 2012 some 90,200 Gazelle LCVs had been sold, according to the Association of European Businesses. But as the Gazelle dated and buyers became more demanding, GAZ lost market share to foreign rivals — in 2012, Volkswagen, Ford, Peugeot and Fiat sold 44,800 LCVs in Russia, with Volkswagen increasing its sales by 31 percent (to 16,100). Gazelle sales, meanwhile, stayed the same. And so the Gazelle, which initially used only domestically made parts, went through several modifications, at a total cost of five billion rubles ($150 million). The result is a complete restyling: it has a diesel engine from Cummins, ZF steering, Mando dampeners, Anvis anti-vibration parts, Bosch and Mando brake elements, a CSA Castellon adjustable steering column, a Sachs clutch, Takata safety belts, a Delphi climate system and an Isringhausen driver’s seat. Both the old and the new models will be assembled on the same line. “Our models have a great future both inside the country and, I hope, abroad… We are working to make such changes in all the production spheres, and GAZ is an absolute example for all the other sectors,” said Prime Minister Dmitry Medvedev at the launch of the new Gazelle. GAZ is already pushing ahead with exports. In autumn 2012, GAZ Group President Bo Andersson said the CIS accounts for about 15–20 percent of its sales. In addition, the company plans to export to Europe, where the Cummins engine, which matches the Euro-5 standard, should be quite competitive. “A very strong argument in favor of buying Gazelles is that all our vehicles are getting more and more parts from various European suppliers,” says Mr. Andersson. In November 2012, GAZ began exporting Gazelles to Turkey. And with the launch of the more competitive Gazelle Next the company will target Poland and Germany. Its producer points out that the Gazelle Next offers the best guarantee terms in its class: now in Russia it includes three years or 150,000 kilometers. “Priced at €19,000, the vehicle is in a class of its own, because European and American LCVs cost at least 30 percent more,” said GAZ Group in a statement.